Herringbone bead stitch forms a pattern where the beads join in a V shape similar to the central spine of a fish. There are a couple of varieties including flat herringbone stitch, tubular herringbone stitch, and twisted tubular herringbone stitch. It is also known as Ndebele stitch after the African tribe that specializes in the stitch. Continue to 2 of 15 below. Tubular herringbone can be made with a wide variety of beads. You can even mix the beads used in one rope with very interesting effects. This rope uses three different colors of Czech size 11 seed beads and 6 lb FireLine thread with a size 11 tulip beading needle. Continue to 3 of 15 below. The base row of tubular herringbone stitch is a circular ladder stitch of beads. To make the base, pick up two beads, ladder stitch them together, and continue adding additional beads until you have a beaded ladder the desired size with an even number of beads. Because herringbone stitch uses pairs of beads in each stitch, you must have an even number of beads in the base row. 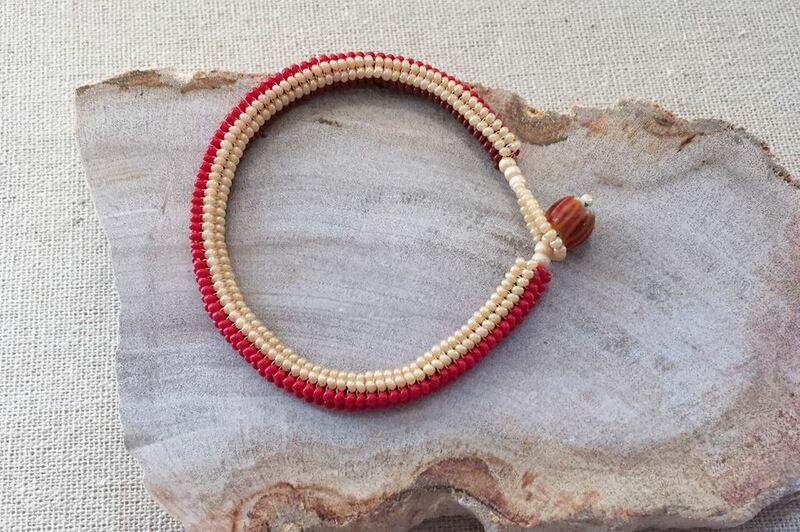 The base of this herringbone bracelet has six beads, in three colors. Continue to 4 of 15 below. Once you ladder stitch base is long enough, use the ladder stitch to join the first and last beads together forming a circle. The working thread is coming from one side of the beadwork and the tail thread is on the other side. For every stitch of tubular herringbone, you will pick up two beads and stitch down through the next bead to the side. Then position your needle for the next stitch by going up through the next bead in the circle. For this example, each two bead column is a different color, so it is easy to keep track of when to pick up new beads, where to stitch down into the next bead and move over to the next row. Start by picking up two brown beads, stitching down through the next brown bead in the base ring, and positioning the thread for the next stitch by going up through the red bead in the base ring. The two new beads you added needs to be separated so they lie flat with one bead on each of the beads below on the base row. Continue stitching the round by picking up two red beads, stitching down into the next red bead, positioning your thread again by stitching up through the next cream colored bead. Pick up two cream beads, stitch down into the next cream colored bead and you have finished the round and are ready to step up. Continue to 6 of 15 below. At the end of each row of tubular herringbone, you will step up to get into position for the next round. The step up is simply stitching through the first bead of the row and the first bead you just added in this row. The two beads will always be stacked on top of each other, so the trick is to simply remember when you need to step up. In this tubular herringbone example, the step-up always occurs when positioning for the next stitch with the brown beads in the row. Continue to 7 of 15 below. Once you are done with the first row of herringbone stitch, your tube may look flat like this picture. Not to worry. The tube will begin to take place in the next couple of round. One unusual feature of tubular herringbone is that the row of beads is connected to the row beneath in a column format and not stitched together until the next round. Continue to 8 of 15 below. Continue tubular herringbone stitch by picking up two more beads, stitching down into the next bead and up the next bead. Step up by stitching through two beads at the end of the round. The tube is starting to take shape! One problem can be adjusting the two beads you add in each step so they separate and lie flat on the two beads below. You can do this by twisting them with your needle. The easiest way to do this, though, can be the way you do your stitch. Pick up two beads, slide them all the way down to the beadwork, and then stitch down through the next bead. For whatever reason, the beads seem to slide into place this way better than if you pick up the beads and stitch into the next bead while the new beads are still on your needle. Continue to 10 of 15 below. After adding the third round of tubular herringbone, your beadwork will start to form the familiar tubular shape. Continue to 11 of 15 below. Continue the tubular herringbone stitch until your rope is long enough. This picture shows the familiar herringbone alignment of the beads as well as the open end where the columns are not yet connected. Continue to 12 of 15 below. There are a variety of ways to finish tubular herringbone stitch. Many artists will make the most of the open ends to make beaded flower petals or other decorative accents. As a beginner, the easiest way to end tubular herringbone stitch is the same way you started, with a row of ladder stitch. Simply stitch down into the next bead and back to the prior row so they connect and close up the tube. Continue until the tube is connected. Once you have ladder stitched all the way around the end, you will have an even and neat beaded edge on the beginning and the end of the herringbone tube. Continue to 14 of 15 below. Tubular herringbone is extremely versatile and looks great with a variety of types of beads. Cylinder beads will stitch a little differently and can be difficult to get your needle in between the beads, especially on the step up at the end of the row. Tubular herringbone looks especially good in ropes with alternating sections of different beads, such as this tubular herringbone necklace pattern. One other interesting option is that you can start the tubular herringbone with a two bead ladder stitch. Instead of one bead in each ladder stitch, you would join two beads together. If you look closely, that is how the gray cylinder rope was started. The advantage is that it is slightly easier to hold the beadwork since you have twice as many beads to grip in the beginning. Continue to 15 of 15 below. There are a variety of ways to add a clasp to tubular herringbone. This example uses a larger barrel bead and bead loop clasp. This style also looks great with a button in place of the bead.